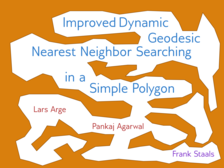 We present an efficient dynamic data structure that supports geodesic nearest neighbor queries for a set \(S\) of point sites in a static simple polygon \(P\). Our data structure allows us to insert a new site in \(S\), delete a site from \(S\), and ask for the site in \(S\) closest to an arbitrary query point \(q \in P\). All distances are measured using the geodesic distance, that is, the length of the shortest path that is completely contained in \(P\). Our data structure achieves polylogarithmic update and query times, and uses \(O(n\log^3n\log m + m)\) space, where \(n\) is the number of sites in \(S\) and \(m\) is the number of vertices in \(P\). The crucial ingredient in our data structure is an implicit representation of a vertical shallow cutting of the geodesic distance functions. We show that such an implicit representation exists, and that we can compute it efficiently.